Navy blue is a dark color, which when alternated with a lighter khaki - can create great impact on minds. Customized navy blue & khaki 58” arc vented economy umbrellas are largely preferred by marketers who wish to shine brightly during crowded industrial events. Windefyer vented canopy, nylon fabric with altering strips of navy blue and khaki, and colorful shoulder strap sleeve – makes promotional navy & khaki 58” arc vented economy umbrella worth trying. 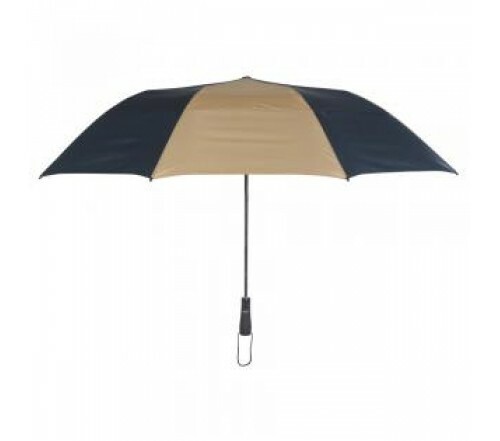 Personalized navy blue & khaki 58” arc vented economy umbrellas always make a smart marketing choice for advertisers working within budget constraints. Dimensions - 58" arc - Closes to 22". Imprint area - 10"W x 6.5"H.